On 3 March the 13th (Forest of Dean) Battalion Gloucestershire Regiment departed from Southampton, arriving at Le Havre around 6:30am the following morning. From here they moved to Thiennes in northern France, arriving on 6 March. As Pioneers for the 39th Division they were kept busy. Moving around the region through March and April their work included making roads, constructing strong points and barbed wire entanglements, reclaiming old trenches, building dug-outs and making breast works. 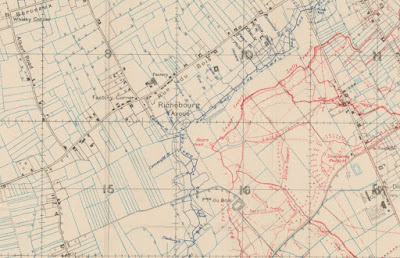 By 14 April they billeted in Essars and engaged in draining, making and reclaiming trenches to the rear of the front line. On 12 April 1916 William Britton of Hotwells, Bristol, was posted to the 13th Battalion. The battalion War Diary records a draft of men arriving at Essars on 20 May and it appears highly likely that William was amongst these men where he joined D Company (an additional draft of 3 other ranks (O.R.) also arrived on the 29th). The Battalion remained at Essars until 16 June, when they moved north east to new billets at La Couture. Here work continued on road, repair and breastwork. At the end of June there was to be a trench attack and on 25 June a party of 9 officers and 285 men moved to Pacaut to practice pioneer work in connection with this. 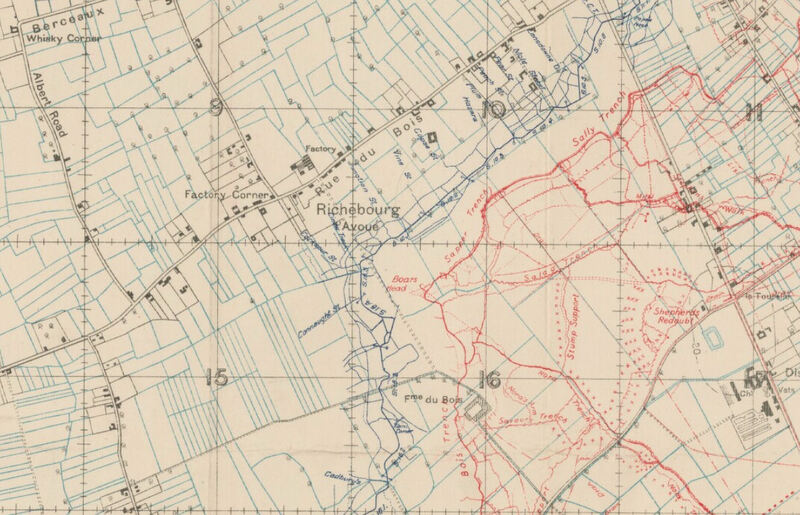 The attack took place on the night of 29/30 June on the ‘Boar’s Head’ section of German front line near Richebourg l’Avoue (seen on the centre of the 1917 trench map below). 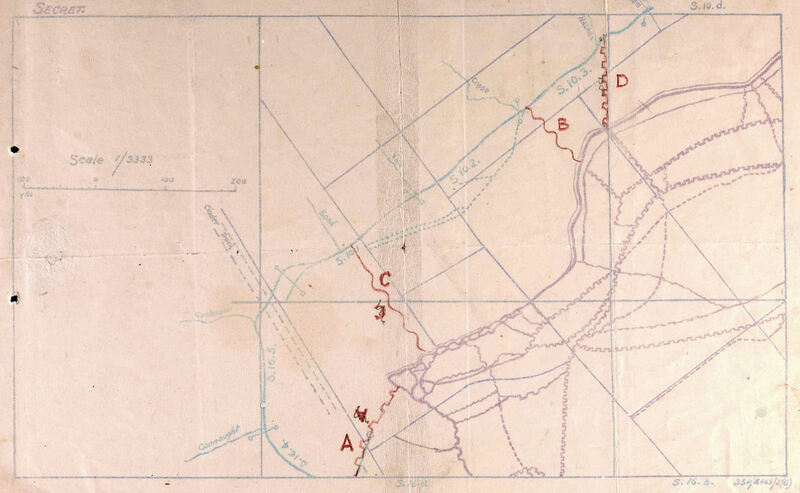 Two parties of the Battalion comprising B and C companies were ordered to extend communication trenches, whilst A and D companies on the flanks were to construct right and left flank breastworks respectively. 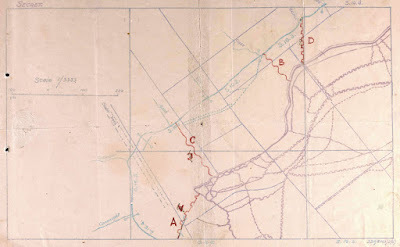 Trench map from January 1917. "Notes on attack on German Front Line, North of the BOAR's HEAD"
On looking over the parapet at 3.10 the remnants of the third infantry wave coming back under heavy shelling and Machine Gun fire. They were also being bombed from the German front line. Under these circumstances the work was out of question, and the officer in charge of the party reported to the Infantry Commander and manned portions of our front line till ordered to get his party out of the line between 7 and 8 a.m.
13th Battalion casualties as a result of this attack were 1 officer killed and 4 wounded, and 10 other ranks killed, 57 wounded and a further 13 missing. The Battalion War Diary notes that on the evening of 1 July “2nd Lieut. Vowles with one Sergt. went out to try to recover wounded reported still alive in NO MAN’S LAND.” The was unsuccessful. For conspicuous bravery in the action of the night of 29/30 June, one Military Cross, two Distinguished Conduct Medals and two Military Medals were awarded to men of the 13th Battalion Gloucestershire Regiment.